Oh those bedrooms, well...the doors will be closed. If you happen to bring children, eventually the doors will be opened and you will stumble upon rooms that look as if they've been ransacked and searched for the lost city of Gold by a treasure hunter. Books everywhere, Legos precariously placed, bits of paper that are really everything from "money to hotel tickets" [what imaginations! 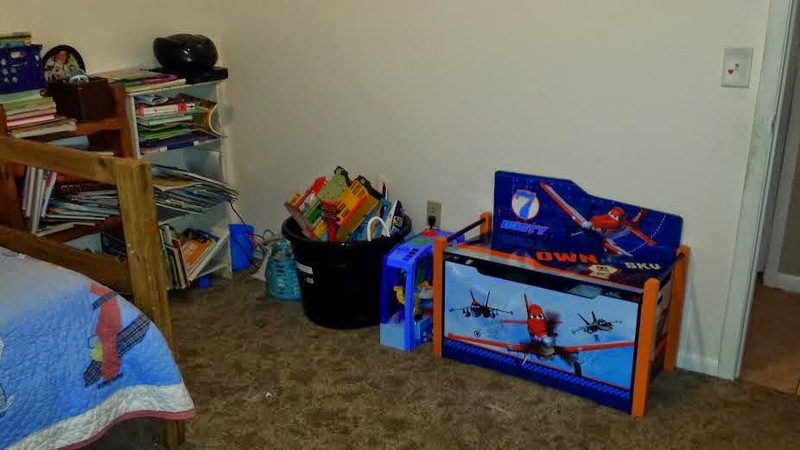 ], Imaginex playsets, space shuttles, crayons, cars, and stuffed toys. You may fear you won't see your child again if they enter the rooms of doom! But I assure you, you will! And they will have had a grand time playing. But I'm happy to see you. The whole time you're here I'll be having fun. But in the back of my mind I'm constantly thinking, "Oh geez, look at the dirt on the baseboards. I didn't get to those. They are going to think we never clean." "Oy, I forgot to wipe the wall by the trash can. Please for the love of sweet baby Jesus, don't look at that wall. It may forever scare them never to eat at my home." "Dang it, there in the bathroom. Please don't look in the corners, I didn't sweep that well in there." Why do I do this I ask myself. Why? Do I think people won't think I can keep it all together? Do I think they'll have reason to not want to come back and visit? Do I think they'll think their children will get sick from my dirty house? I don't know what I think. I think....there are a myrid of reasons. But the main one is within myself. If I can't do all of this, keep house, work, be a mother, be a wife, be an individual, then obviously, I can't keep it together and I'm a dysfunctional mess. Look at the pictures. I do have proof that occassionally I go into the boys rooms and gut them. Today I reorganzied, making it easier for them to keep toys together. 2 toy boxes where they can throw everything in. The bookshelves need work, but tomorrow they'd be messed up again. 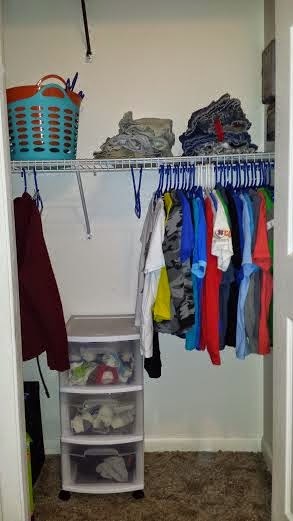 I've decided to hang all shirts and put socks/underwear/PJs in a small rubbermaid cart. 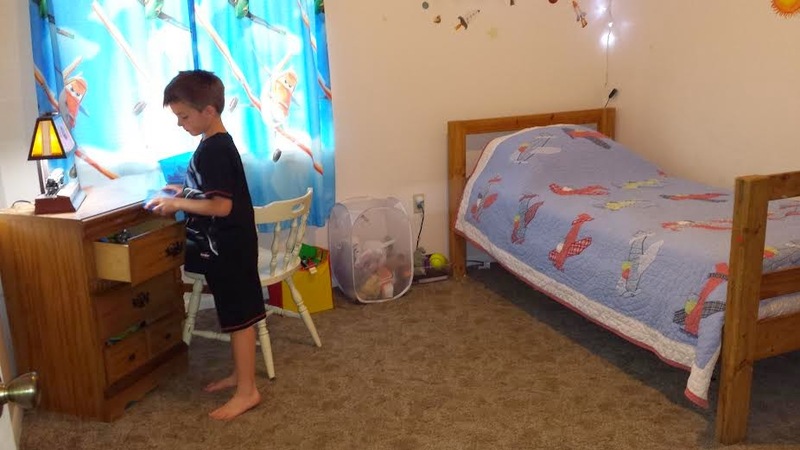 Getting rid of the dresser makes the room look more organzied and clean. Anyway, there's your proof if you need it. But I know by tomorrow evening toys will be strewn about again. I'll find more legos in the kitchen. I'll find shoes in the bathroom. Little bits of paper and drawn pictures throughout the house. Dust bunnies on the wood laminate floor. Juice spills on the kitchen floor. Toothpaste in the bathroom sink. All those "set the timer for 15 minutes and do what you can" approaches, make a daily list, divvy up chores, make a menu, make a schedule, etc....just.don't.work.here. I would set that timer and then be interrupted by a child having a meltdown. Or I would be in the middle of that daily list and notice my Autistic son just standing at the sink playing in the water with his hands, make a mess where I had just cleaned. So I send him to the tub to take a bath get those sensory needs out, while I re-clean the mess I already cleaned. Mainly because if I have him do it, bless his heart, I will have more to clean than the original mess. I'm exhausted by the end of the day. Emotionally, physically, spiritually. I have very little to give. So I'm trying to let some of that go. That need for "having it all together." You may see me in the grocery store, or work, or church, or the mall, or any other place, and I'll say everything's fine. I'll smile. I'll joke. But I'm exhausted. I've probably been in tears that day trying to deal with 2 kiddos with opposite personalities and both with special needs. I've put out fires, not been a good wife because I was too busy trying to clean or put out a fire. Now here I sit typing. It is Sunday evening and for the most part I've spent the last two days catching up on housework. The house looks good! Laundry is coming alone. And I feel proud. But it will be short lived, and that's okay. It has to be okay because that is life. To be honest, while of course things need to be in order from time to time in a home, I'm going to worry less about "keeping it together." Please DO come and visit me. Let's have a playdate with the kiddos! I'll make lunch. But please forgive me if the house isn't clean that day. If you see dirt on the floor, toys strewn about, a couple of loads of laundry on the living room floor, sorted and awaiting their turn, bathtub toys on the bathroom sink, and children's rooms that look as if tornadoes have zipped through....just smile and know that I'd love a spotless house 24 hours a day, but some times I just can't do it. Sometimes when I have a few hours to myself, yes I want to get out and go somewhere, often by myself. To re-group, people watch, eat culturally diverse food, just have fun. Because many times I have those best laid plans, but the evening may end with me in tears, my children in tears because we're just trying to get through the moment. Sometimes I wonder if I was the best choice as mother for my 2 sons. If I was the best choice as a wife. Life is tough and sometimes I feel like I don't keep up. Never the less, I'm here, I'm in it, and I love my family. And at the end of the day that is what matters [not if the floor is clean or not]. Please come and visit, don't mind the mess! I certainly don't mind a little clutter. Hahaha! At least you are keeping your house in order and are making sure that the stay will not only be great, but also hygienic and clean for all your visitors. People can be partners in making a very holistic and proper environment for everyone. In any way, I hope that everything is doing well for you. Thanks for sharing that, Terra! All the best to your family!